Royal Enfield Bullet 350 price starts at Rs.To Be Announced (Ex-Showroom, Delhi). 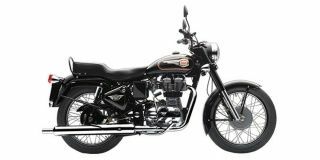 The Bullet 350 comes with a 346cc air-cooled and carburetted single-cylinder motor that puts out 20.07PS at 5250rpm and 28Nm at 4000rpm, delivered to the rear wheel via a 5-speed gearbox. Suspension setup is conventional forks up front and twin shock absorbers at the rear. Despite the retro design, it comes with electric start and a disc brake up front. Q. Is the riding feel the same for Bullet 350 Electra and Bullet 350 Standard, or does Electra have same ride feel of Classic 350, because Classic have a hard acceleration. Q. What is the advantages of ABS in standard 350? What is the difference with old one? Standard 350 has disk brake & that too no ABS . From classic 350 onward ABS version available. Q. Can I install self start in standerd 350 BSIV? Yes and you can also get self start model .